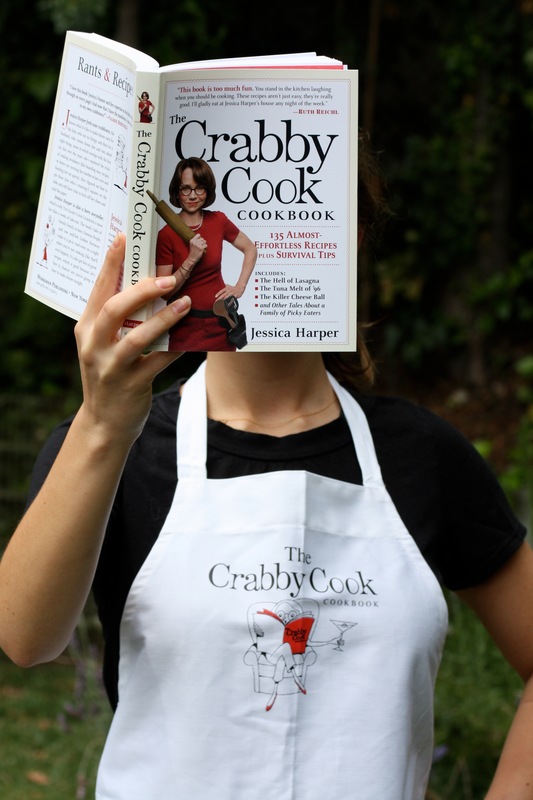 Win an autographed cookbook and a Crabby Cook apron! My mother-in-law, Bette, is coming to stay with us Easter weekend. I know, yikes, right? But while mothers-in-law in general are often the subject of hostile jokes due to their meddlesome and controlling natures, mine happens to be an excellent representative of the species. 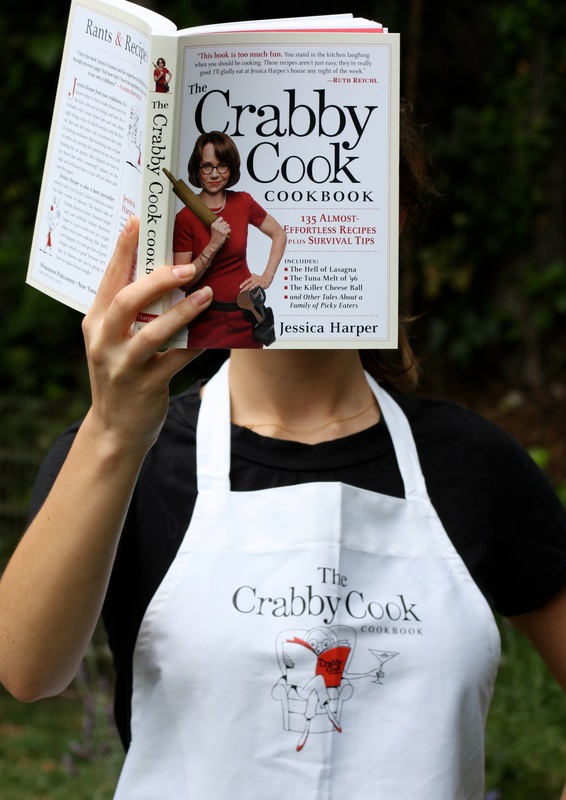 She is very smart and kind, and, unlike her daughter-in-law, she is seldom crabby. Bette’s Jewish, but she likes to celebrate everything. Although Passover was the dominant spring holiday in my husband’s childhood, the Easter bunny showed up annually, too. My mother-in-law’s positive outlook has always led her to rejoice in all of life’s notable moments, regardless of any religion associated with them. All submissions for Eastover (or Passter) entrees must be in by April, uh, let’s see, 20th, I guess. Okay? Go!! This entry was posted on Friday, April 1st, 2011 at 4:43 pm	and is filed under Crabby Cook News, Holidays. You can follow any responses to this entry through the RSS 2.0 feed. You can leave a response, or trackback from your own site. Drain off 1/4 c. of oil from the artichoke hearts and heat in a large skillet or shallow casserole. Saute the onions until they begin to color. Thickly slice the artichokes or quarter them. Beat the eggs with the salt, pepper, and the flour until the mixture is perfectly smooth. Stir in the grated cheeses. Add the artichoke hearts to the onions and stir them around a little, then distribute the vegetables evenly over the area of the skillet or casserole. Spoon the egg and cheese mixture over the vegetables, spread it around gently, and bake the puff in a preheated 350 oven for 20-25 minutes or until completely set, golden brown, and slightly crusty on top. It’s good hot or room temperature. Nice with a salad for lunch. Mix minced garlic, lemon zest and juice, oregano, 2 teaspoons salt, and the oil in a medium bowl. Using a sharp knife, make parallel cuts all over pork leg, cutting through skin and fat (but not meat), spacing cuts 1/2 inch apart. Using a paring knife, cut ten 1/2-inch slits into meat (between parallel cuts). Stuff each slit with a halved garlic clove. Pat garlic mixture all over pork, pushing paste between each parallel line and covering pork. Season generously with salt and pepper. Transfer to a large plastic bag set in a pan (such as a turkey roasting bag), leaving top open to let skin dry. Refrigerate overnight (or up to 2 days). Preheat oven to 475 degrees. Position rack in lower third of oven. Remove pork from bag, and place in a large roasting pan, skin side up. Let stand 1 hour at room temperature. Season again with salt and pepper, and pour wine in pan. Roast for 45 minutes, reduce heat to 350, and continue roasting until thickest part of pork registers 145 degrees on a meat thermometer, about 3 hours. (Check temperature every 15 minutes during final hour of roasting.) Let rest at least 1 hour before serving. Skin-on leg of pork is not difficult to procure but does need to be ordered ahead of time. To save time, mince garlic in a food processor. One hour may seem like a long time for meat to rest, but because of its size, the pork will still be hot when carved. Ham? Pork? What’s up with Jews these days? Olive Cheese Melts- A great finger food that goes well with just about everything. Combine 1st four ingredients. I’m guessing at the amount of mayonnaise. I just use enough to stick everything together. Spread on english muffin halves, then cut into quarters, or spread on slices of cocktail bread. Bake at 400 for about 8 minutes until cheese is melted. Best hybrid Eastover food tradition ever! Adapted from Cookbook of the Jews of Greece by Nicolas Stavroulakis, HAMINADOS FOR PASSOVER. And all you have to be able to do is, literally, boil water–and be able to hang around for long time. At this point you have a choice. The eggshells will be a beautiful, deep reddish brown worthy of an Easter basket or a (jazzed up) the Seder plate. Peeled, the eggs are tan; they have a smokey, earthy flavor. Serve them with horseradish, or, if you really want to overdo the cross-cultural moment, horseradish mayonnaise. Oy gevalt! English muffins and pastry puffs and ham and pork legs on Passover?? Even Bette might have her ecumenical limits! Stick with the opoached eggs and lox on potato pancakes (or matzo)! It sounds perfect. i suppose rabbit would not be an apporpriate choice? So what’s there to get complicated about??!! EGG MATZOH! mix in a bowl with the zest and juice of a lemon, and add as much sugar as you like (start with 2 tablesppons and see how it tastes to you) and a very little bit of cinnamon – maybe just 1/4 teaspoon. And that’s all there is to it. You’ll thank me and wonder why you ever labored over minced sticky apricots and walnuts and bad red wine. DIsclaimer: I know your mother-in-law, and your husband, and his siblings, but that shouldn’t change the reality of how delicious this recipe is, nor its suitability as an accompaniment to ham. Instead of the ham, I’d consider a leg of lamb, which is traditional for both Easter and Passover, and easy to roast. Hardboiled eggs are common to both, too. Other foods especially associated with Passover that you could easily add are charoset, chopped apples with nuts raisins and wine, and macaroons. I don’t know how you feel about baked beans, but they’re an Easter staple for our family! Bake for at least 3 hours. You can do this the day before, too, and obviously stick them in the fridge, then heat them for about an hour at 300 when you want to eat. Not super ‘brunchy’ but trust me – FABULOUS baked beans. I can eat these for breakfast, lunch and dinner. We love them! Holy typos! So sorry about that sprah = spray, mustart = mustard. I must be getting old because I cannot see this little font on the screen! Bette sounds like a wonderful woman, but it is important to know what part of the world they immigrated from. Was it Europe or the middle east? You can never go wrong with a brisket but if their environs were from the middle east then lamb. I have great recipes for both. Kaska is nice if they are eastern european. For Christ sake don’t serve ham, especially with mayonnaise; reminds me of this classic. LOL thanks for that link…I’d forgotten how hilarious that was! I know, ham is so WASP-predictable. Will avoid, i promise. Brisket makes more sense for Bete, and it tastes better! We just made the following (original recipe) on Sunday and it was delish! Hard boil four of the 20 eggs, peel/and press through egg slicer (reserving only the slices that have white and set yolk in them) and set aside. In a bowl, beat the remaining eggs along with the salt and 1 Tbsp of crème fresh. In a nonstick frying pan over medium heat, add the butter, the egg mixture and half of the lox and cook until just set. Turn off the heat and artfully arrange the hardboiled egg slices over the top of the frittata, sprinkle with grated Asiago (being careful not to totally obstruct the egg slices) and the chopped roasted red pepper and set aside. In a separate pot, bring 4 cups of lightly salted water to a boil. Add the spinach and cook (in batches if necessary) until just wilted (about a minute). Drain spinach into a colander and lightly squeeze out excess water. Keep the spinach warm by keeping it in the pot it was used to cook it in. Place the frittata pan into the oven a few inches from the broiler and cook until the scrambled eggs are fully set, the cheese melts and slightly browns. When done, artfully place the remaining lox on top of the cooked frittata, sprinkle on the chopped dill, chives and lightly dust with paprika. Serve with brioche, latkes and a seasonal fruit salad. My matza ball soup is a favorite any time of year. Begin with boiling the chicken broth/stock. While that’s happening, peel the ginger and throw it in a dicer along with the onion, garlic, and 1/2 the apple. You can keep it chunky or puree, your choice. Once the broth is boiling, throw in the contents of the dicer, stir and turn down the heat to medium. Next, peel and cut up the carrots and cut up the rest of the apple. Rinse the kale off and throw it in the pot along with the apple and carrots. Prep the matza ball mix (instructions on box) and put it in the fridge for 15 mins. Cut up pieces of the rotisserie chicken and throw it in the pot. Stir, cover, and turn down the heat to low. I like to use a rotisserie because it’s already cooked, very easy to use, and leaves leftovers. After 15 mins, boil some hot water, roll your matza balls and throw them in the pot of boiling water for 10 mins, give or take. Then serve or put the matza balls in with the rest of the soup and let sit until ready to serve. The overall prep/cook time is about an hour/hour and a half. I realize you said you didn’t want to have to cook something but this is well worth it, especially with jewish in-laws, and this is so easy to make. All due respect to Julie, her mother, the Settlement Cookbook(really?) 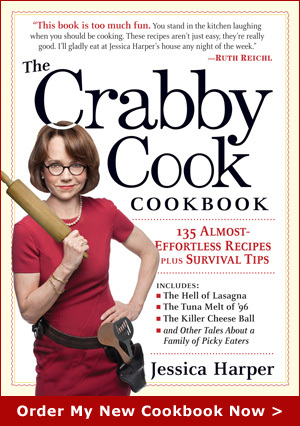 and Texas, but her charoset recipe–no bad red wine, white sugar–sounds like a Southern Baptist version. Which I suppose works for families with mixed traditions because you could pop the leftovers in jello and serve it with Sunday dinner.